Who Is In Error: The Mother of God or Father Fox? Following is a letter written to Inside the Vatican in response to a “letter to the Editor” written by Father Robert Fox. This letter is in response to Father Robert Fox’s recent “Letter to the Editor”, which was published in the July 2001 issue of Inside the Vatican. In his letter, Father Fox derides the idea that there are “‘two distinct documents’ constituting the Third Secret”. He states that the “‘two distinct documents’ mentioned by anonymous ‘scholars’ are a figment of the imagination.” The purpose of this letter is to explain briefly why the idea of “two distinct documents” is not a “figment of the imagination” but a very probable hypothesis. Mother Angelica is no “anonymous scholar,” and Father Fox must surely be aware of her opinion in the matter. Yet he resorts to the shabby trick of attributing widespread doubts about the Vatican’s disclosure of the Third Secret to “anonymous scholars”. It is certainly easier to refute anonymous scholars than real people. 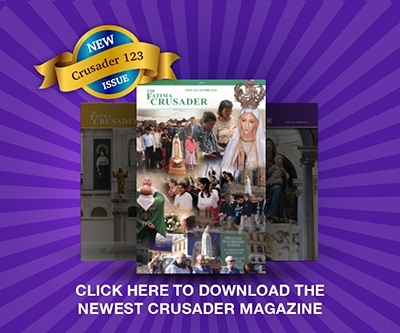 I myself have written an article entitled “Are There Two Original Manuscripts on the Third Secret?”, which was published as the lead article in Issue 64 (Summer 2000) of The Fatima Crusader magazine. I am not an “anonymous scholar”. Now I realize that Father Fox may not consider me a Fatima scholar, anonymous or otherwise, but Father Nicholas Gruner is most certainly a Fatima scholar. My article appeared in The Fatima Crusader, which Father Gruner publishes. The magazine has a distribution of 500,000 copies per issue, and is read by many of Father Fox’s supporters. It is obvious that Father Fox is referring to my article, which puts forward a very strong case for the existence of two documents. As indicated in my article, there is overwhelming evidence to support the existence of two documents comprising the Third Secret in toto. Much of the evidence comes from the testimonies of various credible witnesses, including Sister Lucia herself, as reported by acknowledged Fatima scholar Frère Michel de la Sainte Trinité in The Whole Truth About Fatima, Vol. III – The Third Secret (published in 1985). Some of the evidence comes from Father Joaquin Alonso’s research as the official Fatima archivist. Father Fox claims that Father Alonso never mentioned in his repeated interviews with Father Fox the concept of “two distinct documents”. Maybe this is true; but did Father Fox ever question him explicitly about this? He doesn’t say. In any event, the probable existence of two documents constituting the Third Secret of Fatima is suggested by at least nine discrepancies between what the Vatican disclosed on June 26, 2000 and the facts that we know about the Third Secret, including: (1) that the Third Secret was written on one sheet of paper; (2) that it was written on January 9, 1944 or a day or two before; (3) that it was written in the form of a letter, meaning it was addressed and signed; (4) that it contains actual words of Our Lady; (5) that it consists of 24 lines; (6) that it was transferred to the Holy Office on April 16, 1957; (7) that it was stored in a safe in the papal apartments near the papal bedside; (8) that the Pope first read it in 1978 within days of becoming Pope (as Joaquin Navarro-Valls revealed to the Portuguese press, as reported by AP); (9) that it prompted the Pope’s consecration of the world on June 7, 1981. On the other hand, the document released by Cardinal Ratzinger and Msgr. Bertone on June 26, 2000 is (1) written on four sheets of paper; (2) was written by Sister Lucia on January 3, 1944; (3) is not written as a letter; (4) describes an ambiguous vision seen by the three children of Fatima on July 13, 1917, but contains no words of Our Lady; (5) consists of 62 lines; (6) was transferred to the Holy Office on April 4, 1957; (7) was stored in the Holy Office building; (8) was read by Pope John Paul II for the first time on July 18, 1981; and (9) did not, therefore, prompt His Holiness to consecrate the world to the Immaculate Heart of Mary on June 7, 1981, more than a month earlier. In addition to these discrepancies which I presented in my article, Frère Michel tells us that in 1957 Bishop Venancio (then Auxiliary Bishop of Leiria-Fatima) reported that he discerned inside the envelope containing the Third Secret “an ordinary sheet of paper with margins on each side of three quarters of a centimeter. He took the trouble to note the size of everything.” [The Whole Truth About Fatima, Vol. III – The Third Secret, p. 481] If we examine what the Vatican released on June 26, 2000, we find that there are no right-side margins of any size in Sister Lucia’s 4-page document describing the vision of the Third Secret. Any reader interested in studying the facts supporting the thesis of the existence of two original manuscripts on the Third Secret of Fatima is encouraged to visit the Fatima web site (www.fatima.org) for the complete text of my article (in Issue 64 of The Fatima Crusader) or write to The Fatima Center at 17000 State Route 30, Constable, NY 12926 (in the U.S.A.). I note that Father Fox has made no effort to refute the article in any of its particulars, or indeed to discuss any of the evidence supporting the existence of two documents comprising the Third Secret. Instead, he ridicules “anonymous scholars” and then has the audacity to introduce as “evidence” for his position a letter received from “Carmel of St. Teresa in Coimbra, Portugal, on behalf of both Sister Lucia and her Mother Prioress.” But who wrote this letter “on behalf of” Sister Lucia and the Mother Prioress? Father Fox is attempting to refute “anonymous scholars” with an anonymous letter-writer. Three hours after pronouncing the above Act of Consecration on March 25, 1984, before a crowd of 10,000 people inside Saint Peter’s Basilica, the Pope again referred to “those peoples for whom You Yourself are awaiting our act of consecration and entrusting” (reported on p. 11 of the March 27, 1984 issue of Avvenire, which is published by the Catholic Bishops of Italy). This reaffirms the Pope’s awareness that the consecration of Russia was not done on this day. As proof of the correctness of Father Umberto’s statement, L’Osservatore Romano also published a photographically-reproduced copy of Sister Lucia’s handwritten note to Father Umberto in which she confirmed what she had said to him in the above-mentioned interview. That Father Fox would claim a consecration of the world was the consecration of Russia seems typical of his mode of argumentation. A moment’s reflection on the worsening spiritual and material state of Russia since 1984 (including two abortions for every live birth) should convince any open-minded observer that what the Virgin Mary promised as the fruit of the Consecration of Russia — namely, Russia’s conversion — has not occurred over the past 17 years. Therefore, either Father Fox or the Mother of God would appear to be in error on the question of the Consecration. I rather think it is Father Fox.